Grand Central Life & Style, 9781478918806, 368pp. There are certain things we take as universal truths when it comes to dieting and health: kale is good; ice cream is bad. Until now. When Drs. 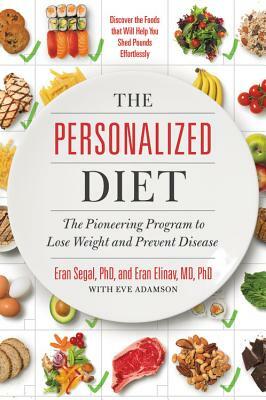 Segal and Elinav published their groundbreaking research on personalized nutrition, it created a media frenzy. They had proved that individuals react differently to the same foods-a food that might be healthy for one person is unhealthy for another. In one stroke, they made all universal diet programs obsolete. THE PERSONALIZED DIET helps readers understand the fascinating science behind their work, gives them the tools to create an individualized diet and lifestyle plan (based on their reactions to favorite foods) and puts them on the path to losing weight, feeling good, and preventing disease by eating in the way that's right for them. Eran Segal, PhD, is a Professor at the Weizmann Institute of Science and the recipient of numerous honors and awards. He travels and lectures extensively worldwide and has published over 120 scientific articles in leading peer-reviewed journals. Dr. Eran Elinav, MD, PhD, is a professor at the Weizmann Institute of Science and a board-certified physician. He has published over 120 papers in leading scientific and medical journals, and he is a popular international lecturer and the recipient of many prestigious awards.